Dateline: Muncie, IN. December, 1990. Well ladies and gentlemen, I think we can all agree. It’s cold today. Sure it’s only 8°F/-13C here in Richmond, and the windchill takes it to 0°F, but that’s still cold in my book. I’ve been asked about hats on many an occasion. I’m all for them. But when it gets cold, style can fly out the window. A fedora, Trilby, or whatever, just isn’t that warm. I usually opt for a cashmere watch cap in colder weather. But today, the wind was just strong enough and I was feeling adventurous enough that I took to Mrs. E’s faux rabbit fur trapper. What a revelation! If you can pull it off, I recommend them as they go very well with long overcoats and the more popular car length coats and North Face jackets. The flaps will also protect your freshly shaven cheeks gentlemen and your wives will love the way they feel under a coat collar if you decide to make a late Christmas present of one this year. Especially a real fur version. My other conundrum has been the touch screen on my cell phone. In extreme cold, they don’t work at all, but for every day winter use, I have to remove gloves to dial, answer, check the weather, etc.. My improvised solution today isn’t very elegant, but maybe someone has a better answer. I layered a fleece mitten, with cut off fingers under a removable flap over a pair of target’s C9 touchscreen gloves. Workable and warm. If only they looked better. Anyone found more elegant solutions? 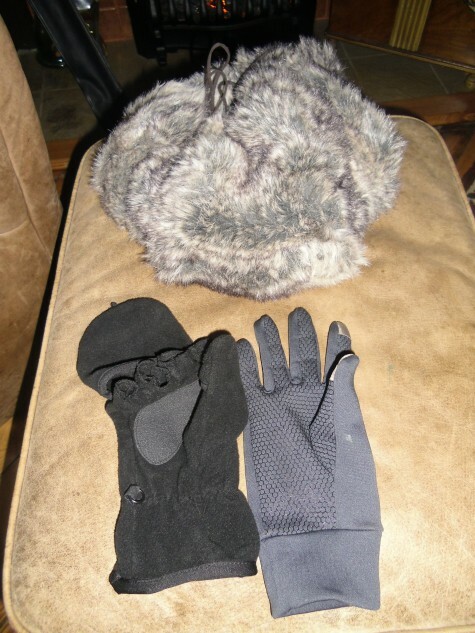 This entry was posted in Outerwear and tagged C9 sportswear, cashmere watchcap, cold weather layering, Fedora, hats, muncie IN, Target, touchscreen gloves, trapper hat, trilby. Bookmark the permalink. The most elegant solution would be for you and Mrs. E to move here to Oregon. We do still have winter, but a much milder form. Besides, we could use some “classing up”, which you would do so well.